i don’t think it’s hyperbole to describe NMC Recordings as one of the bastions of contemporary music in the UK. For as long as i’ve been listening to new music (more than two decades now), NMC’s output has been a dependable point of continuity, and many of their releases have become both landmarks and benchmarks in the history of late 20th- and early 21st century British music. So it’s exciting to see NMC embarking on a bold new initiative: Debut Discs, a new series of 12 recordings to be released over the next four years, exploring the music of “emerging British composers”, whose music is currently under-represented on CD. Launched last month, the first three discs are devoted to the music of Dai Fujikura, Sam Hayden and Huw Watkins. They make for a stimulating and highly contrasting trio, one that resists and attracts in roughly equal measure. 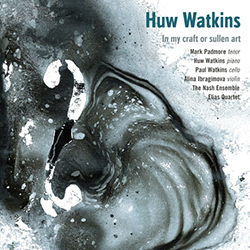 Huw Watkins’ music is emphatically the latter, being by far the most accessible of the three. He opts for a nostalgic brand of music, earnest and lyrical, harking back to an earlier time. There’s nothing pastiche about what he does, and yet it seems entirely right to describe the five pieces on his disc as “neo-romantic”. Melody presides, and while Watkins affords them the opportunity for considerable variety and invention, there’s the unshakeable feeling that one’s heard all this before. The skill with which the pieces are put together can hardly be criticised—there’s not a note out of place, and Watkins’ sense of drama is strong—but the shadows of their progenitors are often so potent as to be a fatal distraction. The piano music—represented here in one of Watkins’ earlier works, the Four Spencer Pieces, played with consummate skill by the composer—manages to loosen its bonds to the past, but they’re the exception on an album that’s otherwise frustratingly over-familiar and straight-laced. Caught betwixt the extremes of attraction and resistance is the music of Dai Fujikura (born in Osaka but resident in England since his mid-teens). The forthright independence of Fujikura’s compositional manner is striking, eschewing the styles and mannerisms of his birthplace; indeed, “Everytime I see some ‘Japanesenesses’ in my own score when I am composing, I delete them”. The five pieces on his disc comprise three substantial ensemble works and two brief solos, all very different in nature and instrumentation. 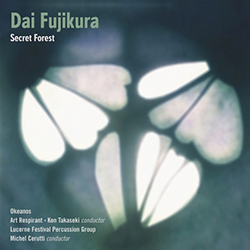 What unites them is a fresh relationship with lyricism, one that allows Fujikura the possibility to go where his ideas take him, where unexpected episodes or shifts feel entirely comfortable (a quality he shares with Takemitsu, but for entirely his own reasons). The sudden bassoon cadenza in Secret Forest is an almost shockingly fragile hiatus in what is otherwise a dense and homogeneous work, dominated by huge bursts of string activity, while the latter half of Phantom Pulse somehow abruptly navigates from percussive bombast to a cloud of resonant lacework with no ill effects. But it’s the closing work, Okeanos, that shows off Fujikura’s skill best, the introduction of sho and koto contributing in no small part to its deeply hypnotic (and at times gorgeous) five movements. Discussion of Sam Hayden’s music has hitherto been dogged by references to its apparent inaccessibility. But his music requires no apologia; it’s true that it is both powerfully demonstrative and utterly individual, but if ever there was a perfect invitation to the listener to sit up and engage with something on its own, genuinely new, terms, this is it. Everything about these four ensemble pieces (plus an electroacoustic chamber work as a bonus download) cries out its contemporary credentials, from the compositional techniques Hayden uses (brief descriptions of which double as programme notes) to the titles of the works, and there are times when it almost feels like a kind of aesthetic clipping is happening. But overall, it’s an invigorating kind of resistance, and gazing into the textures and structures Hayden creates is simultaneously disorienting and captivating. It’s not without its problems; in misguided, the intended momentum seems to short circuit under the strain of its stop-start material, and both system/error and presence/absence come across less as immersive encounters than (undeniably impressive) spectator sports. 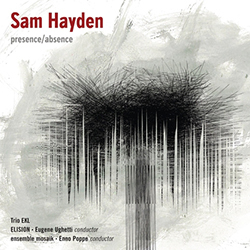 However, in the 20-minute Die Modularitäten, Hayden finds a perfect synthesis of his techniques and outlook; its polyphony is highly dramatic and deeply engaging, less a series of episodes than a large, unfolding narrative with a plethora of twists en route; and the moments when electronics lurk, barely audible, at the periphery are pure magic. 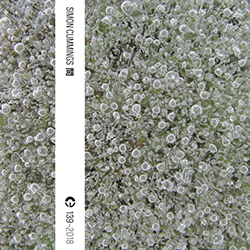 Bonus work schismatics is also outstanding, the solo violin establishing a dialogue with electronics that one doesn’t just follow, but is pulled right into its epicentre. 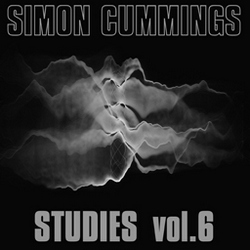 All three releases are available on CD everywhere, and on download from the NMC shop.